Debbie Dart is just an ordinary 16 year old girl - she wants a horse for her birthday. But her dad, an inventor of top-secret gadgets, has a different idea! Debbie is given a surprise gift that exceeds her wildest imagination, and sets her on the first of many exciting adventures. "...in the centre of all this electricity and noise, something was appearing! It gave Debbie such a fright that she jumped backwards to get out of the way. All this only took a second. Debbie didn't know what to do - scream as loud as she could, cry, or burst with joyful excitement." A sci-fi full colour 52-page kids' adventure! Reading ages 8-12, but suitable for kids of all ages. 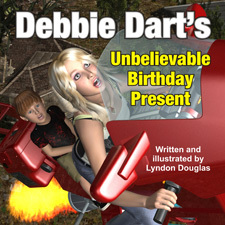 "Debbie Dart's jet propelled motor cycle would take her through the Cosmic Curtain to many exciting adventures. The first of which is told in this large, colourful, beautifully illustrated book."